Clinton High opened boys’ tennis on Monday with a 5-2 victory over Broome. Singles: Ike Waldron (C) defeated Colton Wells 6-0, 6-2; Connor Donley © defeated Daniel Kanipe 6-0, 6-0; Anders Orr © defeated A.J. Griffin 6-4, 6-0; Hayden Minor (C) defeated Kane Lee 6-0, 6-0; Chris Patton (B) defeated Brandon Campbell 6-4, 6-2. Doubles: Waldron-Donley © defeated Wells-Griffin 8-0; Eli Brown-Jeremia Jones (B) d. Eli Brewer-Hayden Stinson 6-2, 6-0. The Red Devils take on Blue Ridge at the Clinton Middle School courts on Wednesday at 5 p.m.
Laurens wasn’t so fortunate, dropping a 4-3 decision at Easley. Singles: Murphy Rush (L) defeated C. Bomar 6-1 7-5; B. Crooks (E) defeated Will Adams 6-3, 6-0; L. Willis (E) defeated Walt Womble 6-3, 6-4; F. Mitchell (E) defeated Brooks Nelson 6-2, 6-1; William Yates (L) defeated M. Dickson 3-6, 7-5, 10-8. Doubles: Bomar-Crooks (E) defeated Rush-Adams 8-3; Blake Nelson-David Hampton (L) defeated M. Wagner-G. Rogers 3-6, 7-6, 10-5. Clinton softball won its fourth straight game, defeating Ware Shoals at home by a score of 16-1. The Red Devils have scored 59 runs in the four-game span. Former LDHS football assistant Anthony Frate is the new head coach at Hillcrest, where Greg Porter left to take the job at Greenville High. 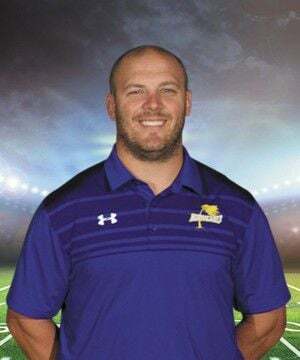 Frate coached under Chris Liner until 2017, when he left to become defensive coordinator at Wren. Laurens golf participated in a 27-hole tournament at Furman University over the weekend, finishing 19th with a team score of 620. LDHS Scores: Bailey Goode 86-48-134, Collin Harlan 93-47-140, Preston Mahon 111-57-168, Jason Rogers 120-58-178. On Monday, Clinton defeated the Raiders, 166-184, at Lakeside Country Club. LDHS scores: Goode 44, Harlan 45, Rogers 48, Mahon 50. CHS scores: Phoebe Carles 37, Zoey Carles 40, Sofia Carles 41, Javi Carles 48.